Peachtree Petals Announces Reservation Savings For Early Valentine's Day Flower Deliveries! The florist is offering additional savings for early same-day delivery of Valentine's Day flowers in efforts to distribute its Valentine's Day sales volume, expand its customer base, and increase online sales growth. Peachtree Petals, a leading Atlanta florist specializing in premium floral arrangements, floral event and assorted gift services, announces reservation savings for early Valentine's Day flower deliveries. The florist is offering additional savings for early same-day delivery of Valentine's Day flowers in efforts to distribute its Valentine's Day sales volume, expand its customer base, and increase online sales growth. 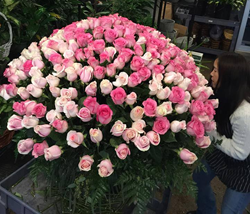 Peachtree Petals pursues to be the best choice in high-quality and custom-designed floral arrangements nationwide. Peachtree Petals is marketing the early reservation savings on the home page of its' comprehensive website. For Valentine's Day reservations made for same-day delivery on Wednesday, February 11th, customers will receive a 15% discount off their floral arrangement. On Thursday, February 12th, Peachtree Petals will offer customers a 10% discount on their floral arrangement order. The florist has specific discount codes for the early reservation dates before Valentine's Day that customers will use. Customers are also able to place their reservation order via phone as well. Early reservation orders made after 1pm on the reservation date, will not be guaranteed delivery. There are benefits to early same-day delivery flower reservations with Peachtree Petals. Along with the savings, customers can be assured their recipient will receive their Valentine's Day flowers before the actual holiday arrives. With early delivery, customers will be able to enjoy their Valentine's Day flowers even longer. With its' large driver staff, Peachtree Petals is able to manage and provide on-time Valentine's Day deliveries. Peachtree Petals is a recognized leader of superior floral arrangements and honored Master Florist and throughout the US. From birthday bouquets to Valentine's Day flowers, Peachtree Petals is able to meet all of your floral needs. Their floral designers have over 50 years of experience and create stunning floral arrangements. Whether you need an Atlanta flower delivery or Los Angeles flower delivery, Peachtree Petals services a growing list of clients, including company floral subscriptions and weekly floral services. The company offers a simple approach to the floral industry, most notably, same-day delivery of all its' floral arrangements.